The Seoul government Monday dispatched a special inspection team to Samsung Medical Center, which has been hit the hardest by the Middle East respiratory syndrome outbreak, as the country struggled in the drawn-out fight against the spread. As of Monday afternoon, five additional cases were confirmed with two more deaths, bringing the total number of cases to 150 with 16 deaths. Of the new cases, a nurse was found to have been infected while performing CPR on a MERS-infected patient at Konyang University Hospital. The Prime Minister’s Office said the special inspection team composed of 13 quarantine officials will supervise and monitor quarantine measures at Samsung Medical Center. The decision came a day after Seoul Mayor Park Won-soon called on the government to take charge of the hospital that has seen more than 70 people catch the virus, including three doctors, after the 14th confirmed patient visited the hospital late last month. The special inspection team will also support the epidemiological investigations which are being conducted at the hospital, officials said. Since Sunday, Samsung Medical Center has suspended operations, stopped receiving outpatients and restricted the visitors of hospitalized patients in an attempt to prevent the virus from further spreading. The partial closure measures will be effective until June 24. After the hospital’s announcement, about 5,300 patients who had been either hospitalized or made appointments at Samsung Medical Center started their “exodus” to other hospitals. Numerous calls have been made to other large hospitals to see if appointments are available, medical facilities said. In order to ensure the safety of the original patients, some neighboring hospitals vowed to take health screening measures on the incoming patients. “Because we have set the rule that those from Samsung Medical Center will receive treatment under isolation, the number of patients we can accommodate will be limited,” said an official from Gangnam Severance Hospital in Seoul. Those having serious illnesses or anticancer treatment will be allowed to stay in Samsung Medical Center, medical staff said. Earlier in the day, President Park Geun-hye pledged to build a stronger governmental response agency for containing contagious diseases. “(The government) will institutionalize the disease response team so that it can work permanently as a key agency against contagious illnesses,” Park said. 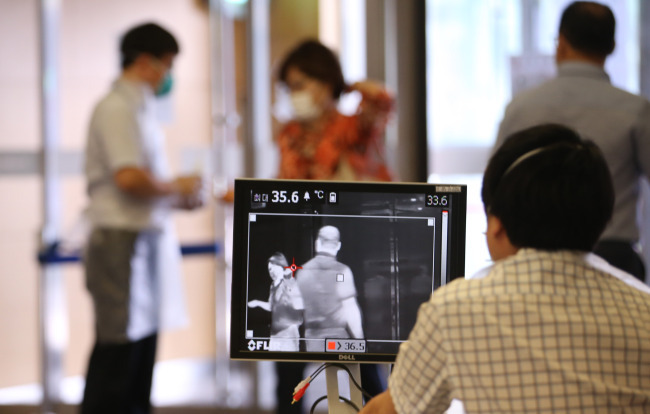 So far, 17 percent of the MERS patients in Korea have been found to be medical staff at the MERS-hit hospitals, the Health and Welfare Ministry said. Of the total patients, about half were exposed to the virus as patients receiving other treatments in the medical facilities. The remaining were family members of the patients, it added. Among the medical staff, nine were nurses, followed by seven caregivers and four doctors. Six emergency workers also caught the virus. Of the total MERS patients, men accounted for 61 percent. By age, those in their 50s took up 21 percent, followed by those in their 60s and 40s with 19 percent each. Of the death toll, those in their 70s accounted for the most with 44 percent, followed by those in their 60s with 31 percent. Nearly 90 percent of the dead had chronic respiratory diseases or cardio-cerebrovascular problems, officials said. Meanwhile, some hospitals have voluntarily shut down the facilities over MERS concerns. SMG-SNU Boramae Hospital in the capital temporarily closed the facility for a half day and conducted disinfections measures. It was found that the 137th confirmed patient, the emergency worker who transferred a number of MERS patients to the hospital, stayed in the emergency room for more than an hour earlier this month. The hospital officials immediately isolated a dozen medical staff members who had come into contact with the emergency worker. Public fears escalated after it was confirmed Sunday that the 137th patient continued to work as usual for nine days despite showing some symptoms. Korea Cancer Center Hospital in northern Seoul also shut down after a Samsung Medical Center patient visited the facility. Although the visitor was not a MERS-confirmed patient, KCCH temporarily closed as part of its preventive measures, the medical officials said, citing the large number of cancer patients with low immunity level. The reopening date has not been decided, they said. Currently, more than 5,200 individuals are under monitoring, the health authorities said.